Did you make a delicious ham dinner and now you have a whole lotta leftover ham you're not quite sure how to use? 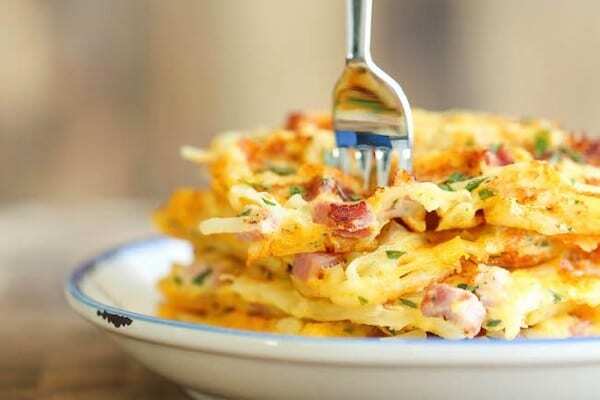 Try one of these leftover ham recipes to use up all that extra ham instead of throwing it out! Mmm… I'm still dreaming of our delicious Easter dinner. However, if you're anything like me, you get sick pretty quick of eating plain ol' ham every night. And if you're anything like me you absolutely HATE wasting. Anything. Ever. Lucky for you I got a little creative! I scoured the web to find some delicious leftover ham recipes. Now you can repurpose your leftover Easter ham to make sure you don't waste a single piece! Make sure to wrap you ham tightly and refrigerate quickly! You don't want to let it site out for too long. If you're not going to use your ham within 4-6 days of cooking, you'll want to wrap and freeze the ham! When I started getting sick of our ham I divided it into dinner portion sizes, put it in a gallon ziplock and froze it. Now I can take out the leftover ham portions as-needed when I'm ready to make a delicious recipe using ham. The ham should last up to 6 months in the freezer. It tastes delicious and fabulous without any issues at all. Here are some leftover ham recipes that I've tried and approve, or plan to try very soon. Ham is one of those proteins that just pairs with pretty much anything – rice, pasta, potatoes and bread! It seriously goes with everything. Check out the variety in these leftover ham recipes. We know you won't be bored using up all that ham! 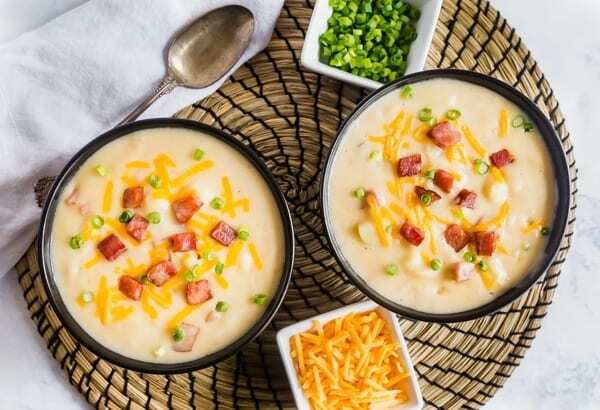 Ham and Potato Soup from The Life Jolie – I'm in love with this potato soup that I made earlier this week! Yummmmm. It's one of those recipes that just gets better as leftovers. Easy Ham Fried Rice – You can't go wrong with fried rice! It's such an easy and versatile dinner that you can throw together with whatever veggies you have on hand. Cordon Bleu Lasagna – Creamy sauce, plus all our favorite meats! 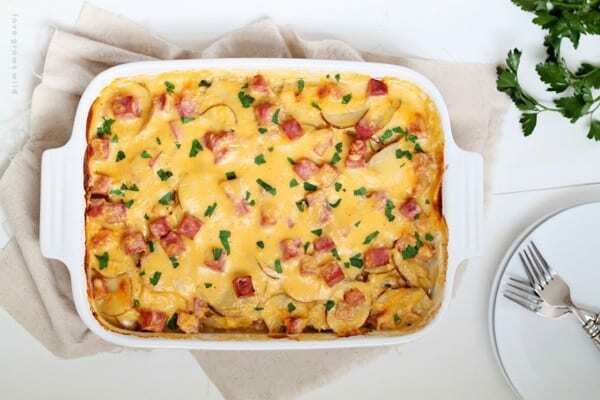 Bacon, ham and chicken make this a cheesy meat lovers dish that the whole family will love. This is one of my favorite ways to use up leftover ham. 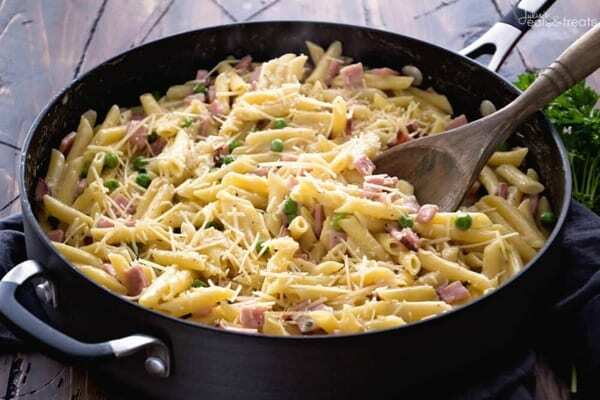 One-Pot Ham and Penne Skillet from Julie's Eats and Treats – Okay, now we're talking! Fast, easy, and only one pot to clean up when the night is through. That's my kind of meal prep. Ham and Bean Soup – If you've got to use up leftover ham in the winter months, this is a quick and easy solution. Just throw all the ingredients, including your leftover ham, into the crockpot and you'll have a nice warm soup to serve up come dinner time! Scalloped Potatoes from Love Grows Wild – This is a classic meal we had all the time growing up, but I'm sure this recipe is much better than the cheap recipe we used growing up. It can be served as a side or a main dish! Either way, this one is on my list to try. Ham Noodle Casserole – I don't know why but casseroles are big around here! They're just a really natural comfort food that seems to please pretty much everyone. This looks like something you can easily pull together with any leftover protein and veggies. Ham and Swiss Stromboli – All you need is 5 ingredients to make this yummy dish. It's another one of those super easy ones that I will recommend! In case you didn't know already, ham is the perfect protein to add to your favorite breakfast dishes. Here are a few recipes you might want to try. 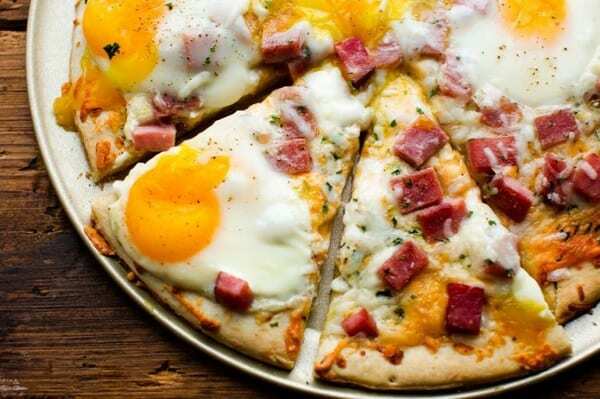 Ham, Egg and Cheese Breakfast Pizza from Delish – Another easy recipe if you have a pizza dough on hand. If not, whip up a quick batch and pull this together. This would be the perfect breakfast for dinner! Simple Ham Quiche – This quiche recipe is awesome because it's SO easy. We don't do broccoli in ours because really, we just aren't that healthy around here. My favorite quiche recipe is my 10-minute mini quiche recipe that I use for EVERYTHING. Ham and Cheese Hashbrown Waffles from Damn Delicious – These are on our must-try list because look how awesome they are! The kids will go crazy when we stick the hashbrowns in the waffle iron. Ham and Cheese Breakfast Braid – I know it looks fancy, but its just not that hard with a roll of crescent rolls, leftover ham and cheese. That's all there is to it! Quick, easy and delicious… but you look like a freakin' superhero. Ham and Cheese Quesadilla – These would be awesome to prep a bunch and freeze them for delicious make-ahead breakfasts that you just need to reheat! Mmmm. Smart and delicious. 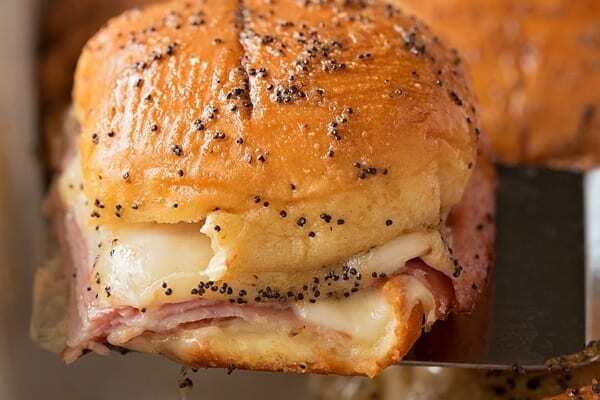 Ham and Cheese Sliders from Lil'luna – Why not add the best sandwich in the world to your menu this week. These sandwiches have the absolute best glaze, you'll understand immediately why these are a popular choice around our house. Ham and Pineapple Kabobs – These kabobs are genius and could be pulled off in so many different ways. Just be sure to soak the sticks first, maybe drizzle the kabobs with teriyaki sauce or brush with brown sugar for a little flava-flave, and grill until caramelized and heated through. 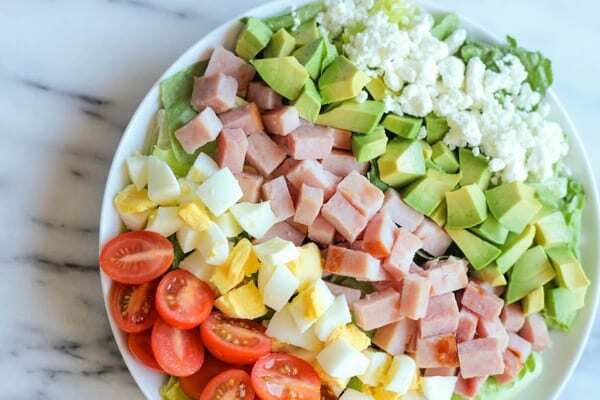 Ham Cobb Salad from Damn Delicious – This is for all you somewhat healthy people! Ham is a yummy source of protein that you can throw into a delicious salad. Add whatever mix-ins you want and top with a delicious dressing of your choosing and BAM… you've got yourself a delicious meal. Monte Cristo Casserole – If you want something kinda fancy, but that will feed a crowd, this is a good option! Ham Salad Dip or Sandwich Filling – I didn't even know this was a thing until recently. But if you love dips, this is something you might just want to try. So there you go! I hope you enjoy these recipes as much as I did or plan to. And please, for Heaven's sake, don't waste a single piece of that fabulous ham! Check out our Leftover Hacks post and find out how to make them taste as good as new! Oh and if you happen to have any leftover Easter candy, these Chocolate Chip Cookies with Leftover Easter Candy are literally the best way to use up leftover Eater candy. I promise. OMG I just did a post on using leftover ham. This post makes it feel like xmas all over again. I love your ideas!! definitely gonna try the ham and potato soup! Here is my leftover ham post as well. These are great! I especially love the skewers and lasagna, so different. Another good one is Cobb Salad, it’ll use up the ham and the boiled eggs from your egg hunt. Fun list. Totally pinning for future reference. OOH I love me a good cobb salad. Thanks for sharing! !